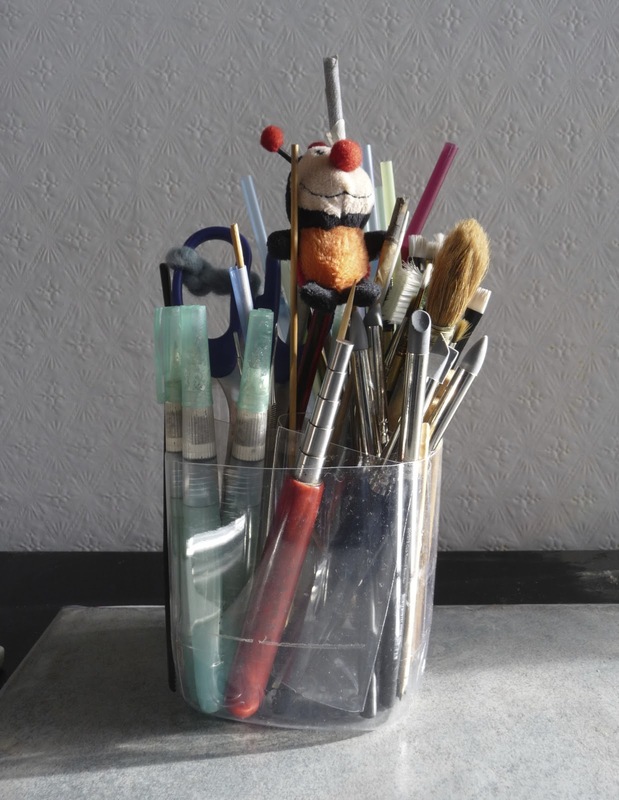 Since I have quite a number of small tools for my art work I am always looking for good storage where I can have everything close by. In the past I have used favourite ceramic cups which I didn't want to throw out just because a handle was broken off or small tin cans. But small items just disappeared and 'out of sight, out of mind' was the rule. With the purchase of a sturdy juice bottle made from plastic I had an idea which I wanted to share with you: a storage container which has compartments, saves space and shows quite clearly where all these brushes, pencils and small utensils can be found. All I used was a marker, a craft knife and a pair of scissors. The first line was made at the top of the bottle where it reaches the widest part, and another one right in the middle. The craft knife was used to make a cut so the scissors could be inserted. The bottom part of the bottle was cut off along the line. My bottle has a square shape, so my next cut went straight up along one corner to the next line. The top part was cut off, which left the very top part of the bottle- that part has found itself to become a funnel! To make the compartments so that the tools stay upright the middle part of the bottle was cut in half. I put the two halves on top of each other and cut through both layers along the two black lines. Taken apart, with the bends pointing to the outside the pieces are connected by inserting the cuts of one piece into the cuts of the other piece. This is a bit like a puzzle game but once you got it you can place the "inners" into the bottom part of the bottle, even out the tops with the scissors and voila, this is it! The bottle didn't need to go into the recycling box and I got a handy and helpful container! If you have a smaller bottle you cut the top part of the bottle only once (in the centre) and not twice like in the bottom left photo. After inserting them against each other it will give you the shape of a cross which will give you four compartments for your container. And: to re-use 100% of your plastic bottle you can drill a hole in the side of the lid, insert a piece of wire to shape a loop on the outside, a kind of hook on the inside, fill the lid with a photo, little shell, glitter etc and pour resin over it to make a pendant. Or use it while crafting with white glue if you need a small portion only or to mix paint or collect more lids to make game pieces or......? 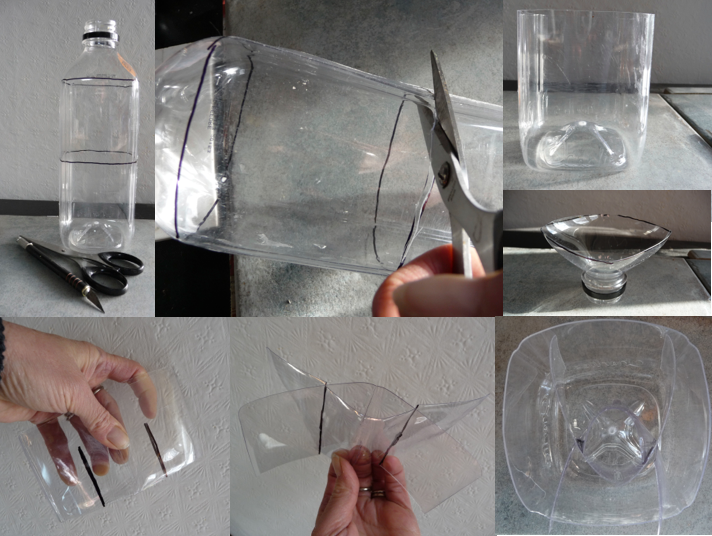 Have you got recycling ideas for plastic bottles? Share your ideas with us! Hey, that would work for makeup too. I like it.